I have lived through the carnage of horrendous foot problems on the trail — blisters, chafing, hot spots, and lost nails — and I have come out the other end with some do’s and do-not’s. Here are a few quick tips to take care of your feet on the trail. Toenails that are even an eighth of an inch too long can jam against the inside of your boot or shoe. The result can be serious pain and a black nail when you get home. Trim each toenail for length in the days before a hike. Be careful to snip the sides of each nail as well — a flange of sharp nail can rub a neighboring toe on a trek to the point of blisters or blood. Tip: Freshly cut toenails can be sharp; be sure to clip a couple days before a hike or run to let the nails de-sharpen before you put the miles down. I have been preaching the miracle of foot lubrication for years. A “slippery” foot is much less likely to spawn blisters and lesions. I use Hydropel, an expensive concoction available from specialty running stores online. 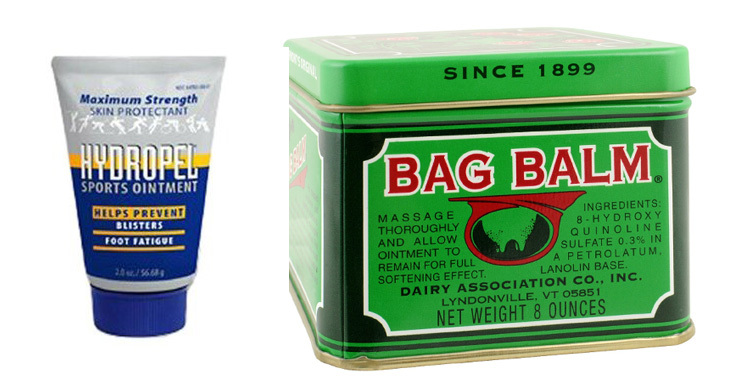 Drug store salves like Bag Balm or Vaseline can work in a pinch, too. Slather the sticky stuff on your toes and heels, and then pull your sock on. Beyond creating a lubed, lower-friction environment, if your foot gets wet salves keep water from saturating your skin or making it “pruney,” an avoid-at-all-costs condition on a hike. A tight-fitting shoe keeps your foot locked in place, lessening chances of the footwear rubbing the wrong way. Your toes should have some room to spread out inside your boot or shoe — they should never contact the shoe’s front. But your heel, ankle, arch, and other parts of the foot should be tightly ensconced to prevent wear and tear. On a hike, if you feel discomfort on your foot, immediately stop to address the sensation. A “hot spot” is the precursor to a blister, and if treated, you can keep it that way. I apply duct tape or medical Leukotape directly onto a hot spot — sticky side down on the skin. Moleskin and bandages are other options, though I find they often shift after a few miles on the trail unless you use some of the “extreme measures” below. Experienced hikers bring first aid to treat foot problems that get out of hand, including gauze, glue, moleskin, and medical tape. One technique involves draining a blister, squeezing super glue under the skin flap, and sealing it shut with duct tape and tincture of benzoin. Advanced blister treatments are beyond the scope of this column, but for a great resource look to “Fixing Your Feet,” a website and book of the same name by John Vonhof, an experienced ultra-runner and emergency room technician considered a top expert in the field. The book is available for $13 on Amazon.